Fun fact: if every American wrapped just three gifts per year using reusable or reused materials, we would save enough paper to cover 45,000 football fields. And it doesn’t just have to be last week’s Sunday comics: this clever wrapping paper is the gift that keeps on giving, six times over! Each 20 x 30 inch sheet is covered with directions to turn it into a dog, frog, flower, balloon, fish, and crane. Origami Wrap is designed by ILOVEHANDLES and sold in sets of five sheets. Find it in The Colossal Shop. Brooklyn-based polymath Robby Kraft currently teaches coding to artists and designers at Parsons and the School for Poetic Computation, but his love for the connected worlds of art and math began at a young age; he started folding origami in elementary school. More recently, Kraft was introduced to the algorithmic aspects of origami. Around 2013, he began to learn more through Erik Demaine’s origami lectures at MIT, and Robert Lang’s books. 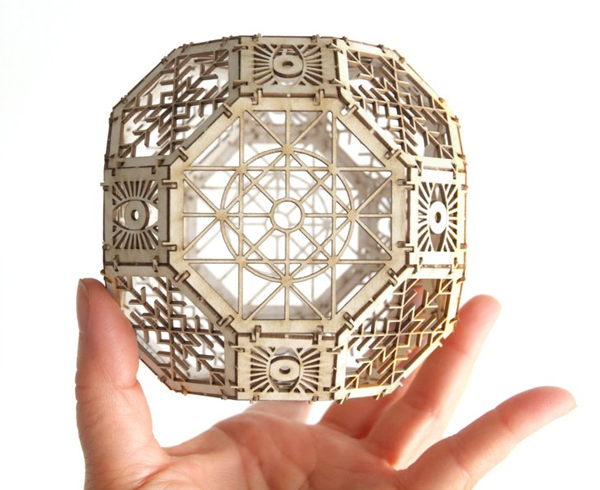 In addition to folding increasingly intricate works designed by others in the origami community, about two years ago Kraft started using algorithmic code to design new origami patterns. Kraft is also a classical musician, and describes the similarity between sheet music and origami: “the crease pattern and diagrams are instructions on a mathematically flat 2D manifold, impossible in the real world, so to fold an origami is to capture it into the real world and add imperfections.” Kraft is working on releasing the code he created to the public, and he shares with Colossal that in the future he hopes to publish a book on origami design. You can follow his work on Instagram and Twitter.